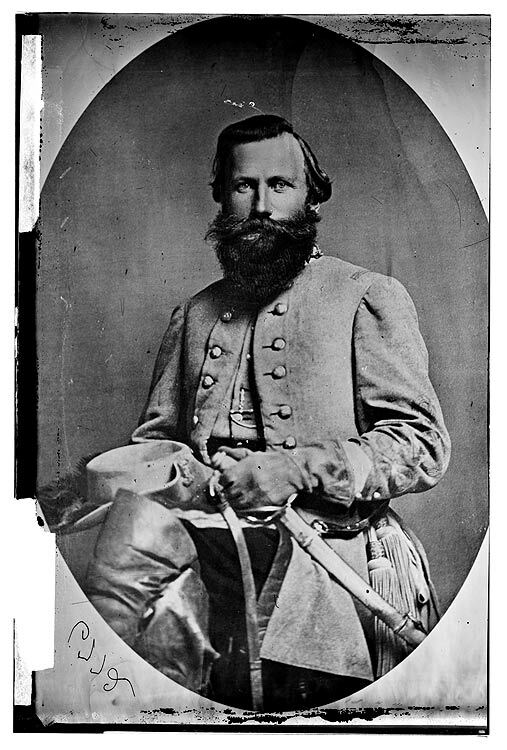 Our aunts told us children with pride that we were all cousins of Major General J. E. B. Stuart, the great cavalry chief of the Army of Northern Virginia. His mother was Elizabeth Letcher Pannill, the daughter of David Pannill and Bethenia Letcher. Her grandfather was William Pannill III, who lived in Orange County, Virginia. General Stuart, at the behest of his mother, took the pledge as a boy and abstained from alcohol. After he suffered his mortal wound at Yellow Tavern in 1864, his attendants offered him alcohol to ease his pain. He refused, saying he was not going to break his promise on his deathbed. Go to the website famouskin.com and you will find more fascinating Pannill relations. For example, you will find that Teddy Roosevelt is also our cousin. Theodore Roosevelt Sr., the father of the President, married Martha (Mittie) Bulloch, of a Georgia family. Mittie Bulloch descended from another Elizabeth Pannill – the daughter of William I and grand-daughter of Thomas. Teddy Roosevelt was three when the Civil War broke out. According to the biography by Edmund Morris, The Rise of Theodore Roosevelt (New York 1979), Roosevelt’s uncles on his mother’s side – all Georgians – joined the Southern army. Roosevelt senior declined to fight against his brothers-in-law. Even though the Roosevelts lived in New York City, Mittie Roosevelt and her mother, who lived with the family, made socks for Confederate soldiers. They hung a Confederate flag from the window of the Roosevelt mansion whenever the South won a victory. With all his Southern ancestors, Roosevelt was bi-sectional. Given the available records, being able to trace our family back ten generations, down every line, would for most of us be a notable achievement. How much Pannill DNA resided in the Roosevelts? Not much. Teddy Roosevelt was born in 1858. Thomas Pannill died about 1677, according to the Roosevelt chart. In that generation, Teddy Roosevelt had 503 ancestors. Grandparents ascend in the ratio 2–4-8-16 up (almost) to infinity. As some wag said, we are all related to Charlemagne. What a relief. According to Famouskin.com, another of the descendants of William Pannill I and Frances Sterne was Lee Harvey Oswald, the assassin of President Kennedy. Famouskin lists him as a fourth cousin of Jeb Stuart, three times removed. He’s a cousin of all Pannills. In this case, we’re talking of infamous kin.